As you might expect by it's not insignificant $320 CDN/USD sticker price, the E-ATX-sized Gigabyte GA-X79-UD5 motherboard is absolutely chock full of features and connectivity. 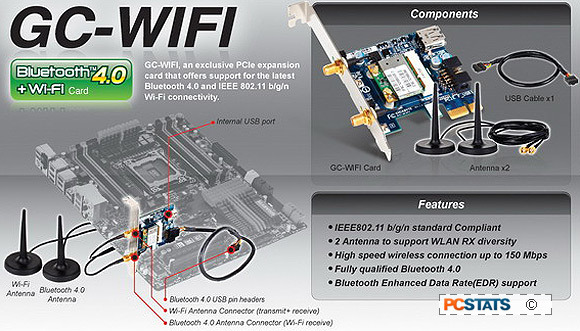 The board is accompanied by a dual antenna WiFi 802.11n / Bluetooth 4.0 PCI Express x1 card as well. Bluetooth Smart 4.0 is the latest wireless standard used by tablets and smart phones for synchronizing data (ie. Apple iPhone 4s), so this is a handy addition. At this point you might be wondering what's the main difference between this board and others; the answer is memory capacity. Gigabyte's GA-X79-UD5 board is equipped with eight DDR3 memory slots, not the usual four. Given 8GB sticks of RAM, that means the GA-X79-UD5 can accommodate up to 64GB of quad channel DDR3-1066/1333/1600/1866/2133 system memory! Extreme Memory Profiles (XMP) are fully supported, of course. Built around the successor to the Intel X58 (LGA1366/Nehalem), the Intel X79 Express chipset supports socket LGA2011 32nm Intel 'Sandy Bridge-E' 2nd Generation Core i7 processors. (The highly regarded, 3.6GHz Intel Core i7 3820 chip is a good option at about $360CDN/USD.) An innovative 12-phase overclockable Voltage Regulating Module (VRM) design helps deliver stable power to the processor and reduce excessive electrical noise. 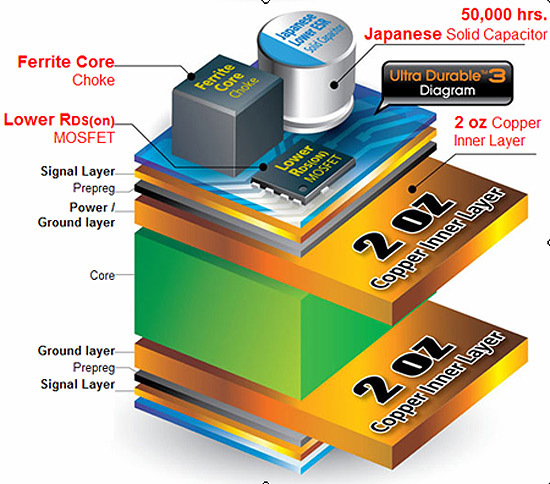 Build quality is reinforced by Gigabyte's use of leading edge surface mount components such as POScaps, MPFC chokes and DriverMOSFETS. Longer lasting solid state aluminum capacitors and extra thick copper PCB come standard. On the graphics card front, gamers will be happy to know the GA-X79-UD5 supports two-way nVidia SLI and three-way AMD Crossfire videocard set ups. A pair of nVidia Geforce or AMD Radeon videocards will run in x16/x16 and x8/x8/x8 modes respectively. All three physical PCI Express x16 sots (x16/x16/x8) are PCI Express 3.0 compliant. The remaining expansion options consist of a pair of PCI Express x1 slots and a legacy PCI slot. INCLUDES: User's Manual, Driver DVDs, (4) SATA cables, 2-way SLI bridge, 3-way SLI bridge, 2-way Crossfire bridge, I/O shield, USB 3.0 front panel bracket, USB jumper cable, GC-Wifi 802.11n/bluetooth 4.0 PCI-e x1 Card, (2) antennas. The GA-X79-UD5's storage options include six native SATA connections and six additional SATA III channels. The Intel X79 provides two 6Gb/s SATAIII and four 3Gb/s SATA II (RAID 0, 1, 5 and 10) ports. Three Marvell SE9172 controllers tack on four internal 6Gb/s SATAIII ports (RAID 0,1) and two 6Gb/s eSATAIII ports at the rear I/O panel. 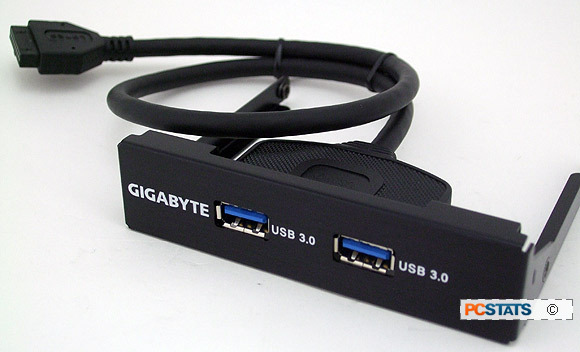 The e-SATA jacks consist of one USB/eSATA combo type. No FDD or IDE devices are supported. In total, that works out to (6) SATA III and (4) SATA II internal ports on one board. With that much storage room it's worthwhile installing the OS to a nice quick SSD and configuring a separate RAID 1 or RAID 5 array for critical data. At the back of the GA-X79-UD5 motherboard you'll find two SuperSpeed USB 3.0 ports (two more via USB 3.0 header), seven USB 2.0 ports (six more via headers), a hybrid eSATAIII/USB 2.0 port and Firewire (one more via header). A single GbE 10/1000 network connection is supplied by the Intel X79 chipset, along with 7.1 channel Intel high definition audio (optical S/PDIF and headphone outputs). The audio system is Dolby Home Theatre compliant. 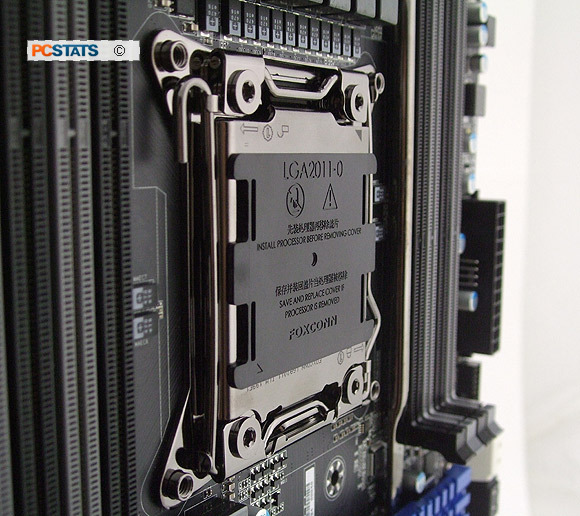 While Gigabyte has released the GA-X79-UD7 model with dedicated overclocking tools, the GA-X79-UD5 PCSTATS is reviewing today is still quite potent. Overclocking options in the BIOS are massively detailed and a new instrument panel called '3DPower' opens up an intimidating world of voltage controls. Work a day overclockers get five fan headers (three 4-pin PWM / two 3-pin), a rear I/O clear CMOS button, reset and large illuminated power buttons, the Gigabyte OC switch, dual BIOS and our personal fav... automatic BIOS recovery after a bad overclock. The list of Gigabyte-specific software features is fairly extensive: 3D BIOS, Dual UEFI BIOS, TouchBIOS, @BIOS, 3D Power, Q-Flash, EasyTune, Smart 6, Cloud OC, On/Off charge and several others. '3D BIOS / Dual UEFI BIOS' and '3D Power' are pretty extensive aspects of this platform, so we'll focus on them in some detail momentarily. 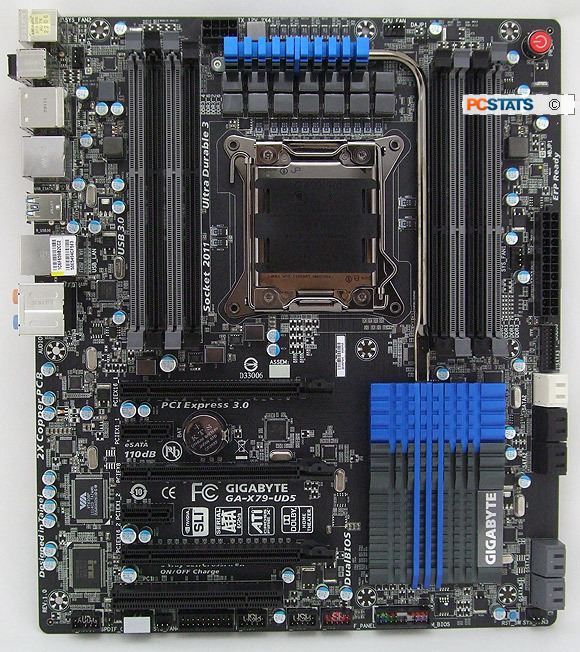 The Gigabyte GA-X79-UD5 motherboard is made for 64-bit operating systems. That's not to say it can't run a 32-bit OS, it's just that 32-bit operating systems are architecturally limited to 4GB of addressable system memory. To take full advantage of the eight memory slots on the GA-X79-UD5 users must install a 64-bit version of Windows 8 / 7 / Vista / 2003. To that end, PCSTATS upgraded its Motherboard Test Platform to Windows 7 Ultimate x64 and bumped the memory from 4GB to 16GB. For the sake of previous comparisons, we've included a full set of 32-bit Windows 7 / 4GB benchmarks on the Gigabyte GA-X79-UD5 as well. The Gigabyte GC-WiFi card bundled in with this motherboard is a combination 802.11b/g/n Wi-fi and Bluetooth Smart 4.0 device. The aim of this wireless card is to better integrate the home computer with portable devices like a smart phone or tablet (ie. Apple iPhone 4S and iPad). The key technology here, Bluetooth Smart 4.0 is what you'll need to leverage mobile apps that can interact with content on a PC. By including the Wifi/Bluetooth 4.0 card up front, Gigabyte is providing users with basic tools to set up a simple 'Cloud environment' at home. Explaining all aspects of Bluetooth Smart 4.0 is beyond the scope of this review, but basically you can think of it as a catch-all name for the three preceding Bluetooth specifications, rolled into one. We should note that while the theoretical maximum data transfer speed of Bluetooth 4.0 is pegged at 24 Mbit/s, this is not over the Bluetooth link itself. Rather, the Bluetooth link negotiates the connection and data is sent over an 802.11 link - hence the reason for the standard Wi-Fi antenna attached to the Gigabyte GC-WIFI card. On a final note, Microsoft Windows 8 will support Bluetooth v4.0 Smart.... so make sure your next smart phone does too! Next up, a quick look at the Intel X79 chipset followed by a 360-degre up close look at the Gigabyte GA-X79-UD5 motherboard - let's take a look at $320 bucks gets you.